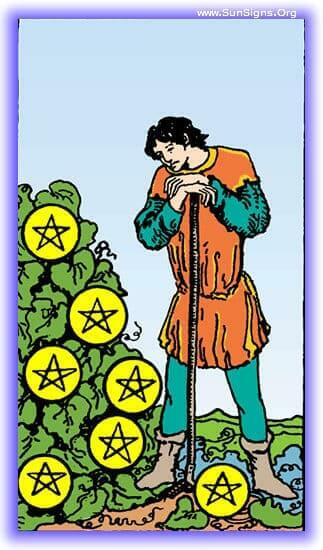 The Seven of Pentacles tarot card represents profit and reward from a long-term investment. This is nearing the reaping time for the Minor Arcana, what we’ve sown so carefully and tended so long is finally about to come to fruition. It is this vision that the Seven of Pentacles embodies. It represents the time when we are investing for long term rewards, or reaping the rewards of the same. 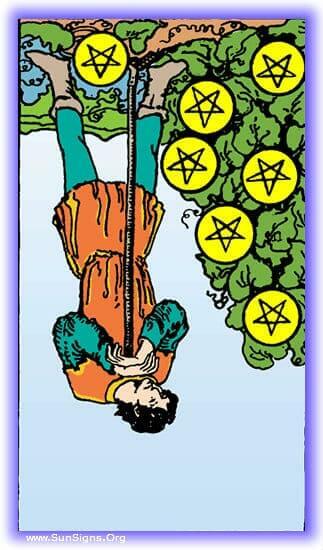 At its worst the seven of pentacles can represent frustration over investments not paying off. Some things wind up not being worth the wait. The Seven of Pentacles upright represents that it’s time to begin careful investments, and can signify that an opportunity before us is a good one. Alternately, if we have been making investments in the past, it is likely that we’re now going to be seeing returns on that. This represents that you’ve been carefully placing your money and time, and investing it wisely. This is a time where walking carefully has been serving you well. There is an opportunity in front of you, one that is very tempting for you to invest in. Sure enough, this is an excellent opportunity for you to pursue, and this tarot card showing is telling you to pursue this opportunity. There is a long term investment you’ve made that is about to provide a reward at long last. You’ve been wondering whether or not it was going to pay out, this is your signal that it absolutely is. The Seven of Pentacles showing up inverted at this time represents unfocused work and a lack of security in what you’re investing your time and energy in. There is a good chance your concerns are valid, and that you won’t be seeing the returns you hoped for. This is a warning that it’s time to slow down the amount of energy you’re pouring in or to stop altogether before it breaks you. The past few months have seen you increasingly listless and unfocused, none of the projects you’ve set your mind to have actually panned out, and you can solidly place that blame on your lack of consistency in dealing with them. You’ve been investing time and money into a project or opportunity, and it hasn’t been paying off. The Seven of Pentacles tarot card showing up is a distinct warning that it isn’t going to, and sure enough it’s time for you to cry off. Pull out while you still can. There is a point in your current relationship where the money and time you’re investing just suddenly seems like it’s not worth the payout you’re getting. Your assessment is going to start being absolutely accurate at this time. If they don’t start changing their tune, your relationship doesn’t have long left to it.